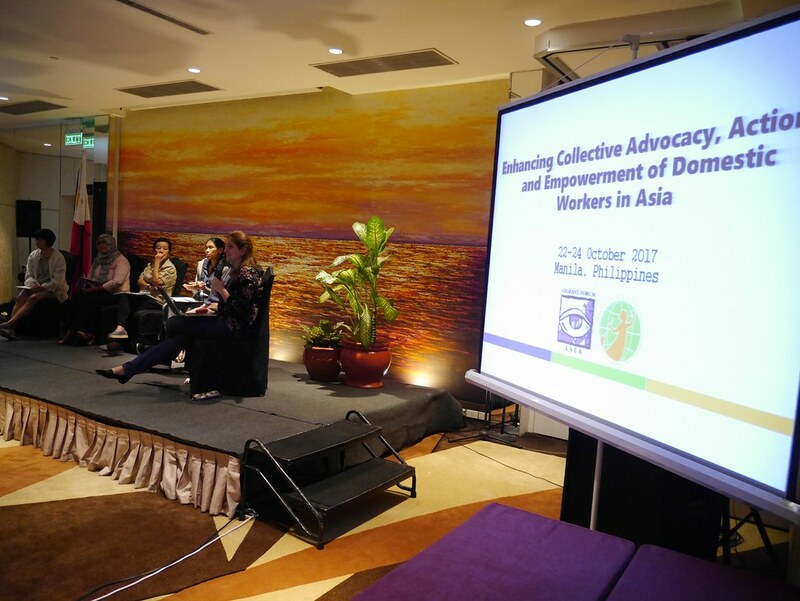 The IDWF and MFA (Migrants Forum Asia) organized a regional meeting, "Enhancing Collective Advocacy, Action, and Empowerment of Domestic Workers in Asia" on Oct 22-24, 2017 in Manila. 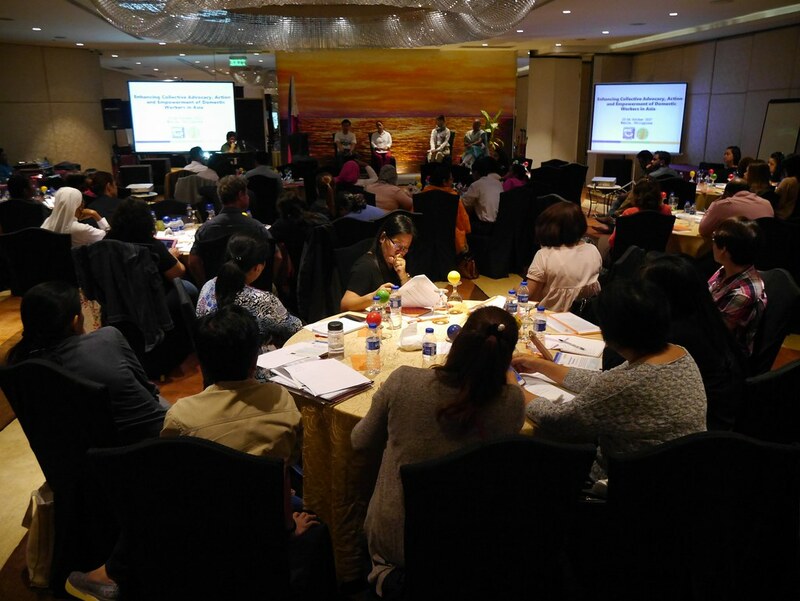 The conference was to build on the gains of the 2011 Regional Conference titled "Realizing Decent Work for Domestic Work for Domestic Workers, Towards Ratification of C189 in Asia" which was jointly organized by IDWF, ILO, ITUC-AP, Global Network and MFA. The conference brought together 65 participants from 17 countries from Asia and the Middle East. They were domestic workers leaders and representatives, domestic workers unions and federations, migrant groups and advocates, trade unions, civil society, lawyers, academics and members of parliament. Two domestic worker leaders, Himaya Montenegro of UNITED, Philippines, and Dina Nuriyati from SBMI, Indonesia, gave the keynote speeches to open the conference. The participants examined the developments in the region after the adoption of ILO Convention 189 on Decent Work for Domestic Workers, exchanges on successes and challenges in organizing domestic workers and the support for workers to access to justice, social dialogues, alliance building, and useful tools for the work on domestic workers. A dialogue session with parliament members and the staff of parliament members from Bangladesh, Cambodia, and Nepal was organized before the end of the conference. Asia is slow in ratifications of C189. Until now, only the Philippines has ratified C189. Despite this, there is progress on national policy and legal protection for domestic workers. For examples, Bangladesh adopted a Welfare and Protection Policy on Domestic Workers in 2015. Nepal newly adopted Labour Act 2017 are now covering domestic workers. 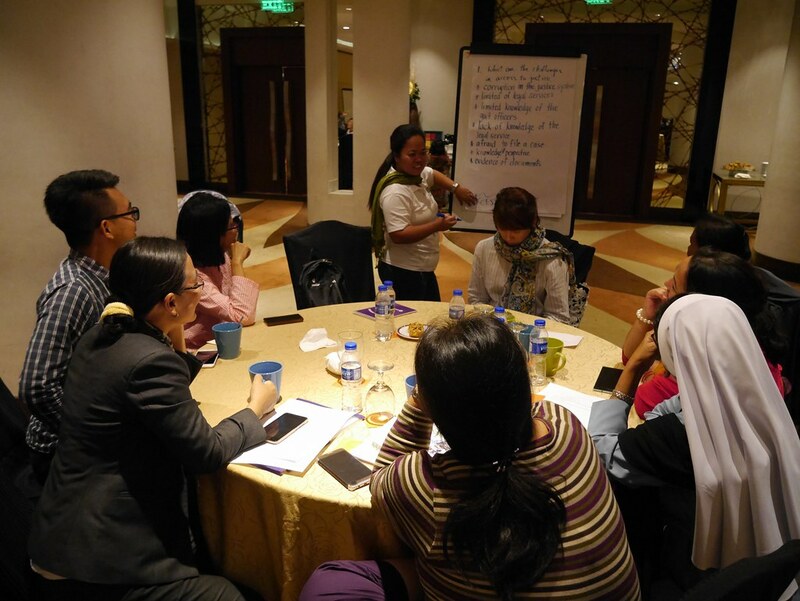 Following up an overview on the regional development of C189 ratifications, policy, and legal changes, domestic workers leaders shared their successes in organizing. The RAP method of Jala PRT, Indonesia, has been a useful tool for organizing. 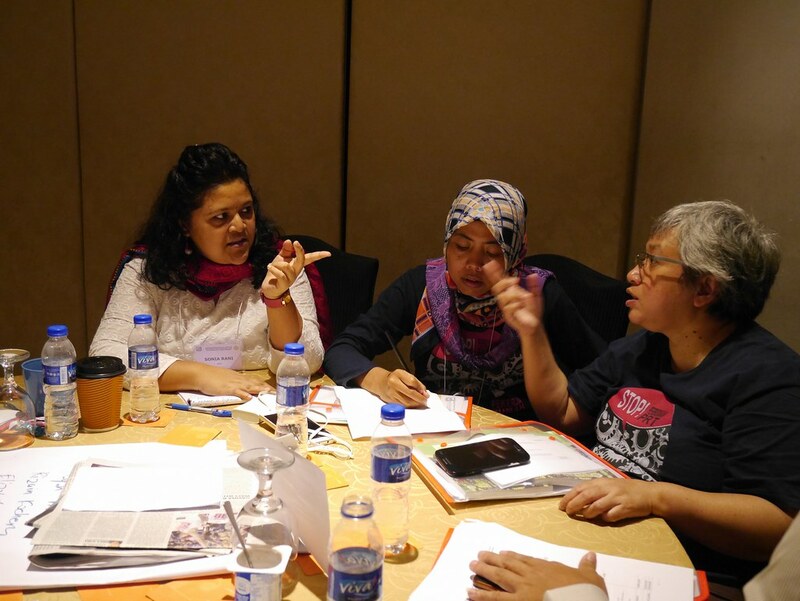 (See Chapter 3 of Eight Good Practices in Asia for details) Leni Suryani, a domestic worker leader of Sapulidi Domestic Workers Union in Jakarta, shared that her union has successfully increased domestic workers members from 300 in 2016 to 1,634 by mid-2017. Countries that are hostile to organizing do not stop workers to get organized. Jeana Payas of AMMPO, Malaysia, Frewoini from Domestic Workers Solidarity Network, Jordan and Malani from Sri Lankan Women Society, Lebanon, all keep on gathering domestic workers, doing lots of rescue work and assistance despite all the challenges. Malani called especially for urgent attention to the rights of domestic workers. "I've been working in Lebanon as a domestic worker for 35 years, no one has ever come to ask me what are our needs," she claimed. It is clear that when domestic workers can be organized, domestic workers can voice out their demands and represent themselves for a betterment of the society. Priscilla Mok from FADWU Hong Kong shared the federation's victory in exposing the problems of excessive and illegal agency fee and its political lobbying work which have contributed to the government's adoption of the Code of Conduct on employment agencies. Nalini Nayak from SEWA India shared the training and organizing of domestic workers, as well as the coordination and national advocacy at the National Platform on domestic work. Agnes Matienzo-Peralta from MFA shared policy dialogue and intervention on the regional level. Rex Varona shared the networking and coordination from the Philippines side to support migrants abroad and the returned workers and how the network advocate for policy change. To gain space for organizing and policy changes, we need partners and alliance to support our work. Jantana Ekeurmanee from Homenet Thailand has successfully established the Network of Domestic Workers in Thailand. She finds that Homenet Thailand, being a women organization organizing informal workers have the strength in organizing domestic workers as it has been distributing information on informal workers. It also has rich experiences in advocacy and women's issue. Brahm Press, MAP Foundation Thailand, shared their experiences in organizing community radio channels to reach out to migrant workers. Nasrikah from Serantau Malaysia shared the tips in pressing the government for changes is continuous pressure. Marie-Jose from IDWF shared some good practices in engaging the private sector. In Zambia, domestic workers organizations negotiated with the government with the adoption of Code of Conduct for employers. Agencies are encouraged to promote the Code of Conduct. In France, trade unions signed collective bargaining agreement with private employment agencies and employers, and CSO/service providers. Domestic workers very often are provided no access to justice with legal or formal channels. However, continuous struggles and direct actions can turn the tides. Angelina Katoh from UNITED Philippines shared the case of Bonita Baran - a domestic worker who is left blind because of abuses by her former employer. She battled for five years in legal battle. Her employer was finally pleaded guilty and was sentenced to jail for 40 years. In another case of a domestic worker in Bangladesh named Laila whose dead body was found, NDWWU has been fighting for her justice. The union organized actions against the police as the police tried to falsify the report. Thomas from Kuwait shared that most domestic workers who are abused are very often deported without any justice is sought. Language barriers, lack of legal assistance, pressure faced by officials to drop the case from the employers are some challenges. During the conference, participants discussed in groups to exchanges strategies and experiences. They also drafted a statement to call the coming up ASEAN Forum on Migrant Labour (AFML) to adopt urgent and effective policies, instruments and mechanisms to protect and promote the rights of domestic workers.